I wasn’t the most charming, or the best known ad sales executive at the places I worked. I didn’t take my clients to better restaurants than my colleagues or competitors, and I didn’t send better presents. 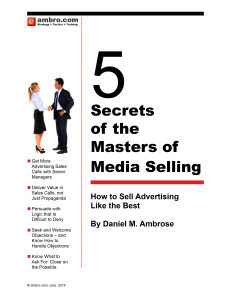 But I became the best sales person by applying the lessons I teach in Masters of Media Selling, co-produced with MediaPost. Too many sales trainers take the “be like me” approach to teaching advertising sales. But there are successful advertising sales people of every size and shape, and of every personality. Successful advertising sales people, the ones who sell more than their competitors or more than their colleagues, make the extra sales because they utilize one or more of the 5 Secrets. There are only 3 ways to sell more advertising then your competition: Get more appointments, deliver a more persuasive “pitch,” or interact more skillfully with probing, handling objections or closing better. I can teach you the 5 Secrets of the masters that address the three ways to sell more. These 5 Secrets are available to all sales people who care to learn them. 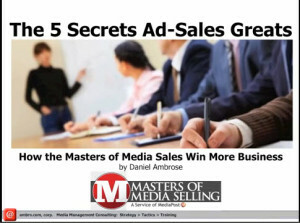 Watch the Masters of Media Selling introductory video here. Then sign up for my Masters of Media Selling seminar; next up: May 21st and 22nd in NYC during Internet Week.